This is one of my favourite smoothie recipes. I have a not-so-secret addiction to blueberries, and a deep respect for the lovely stinging nettle. 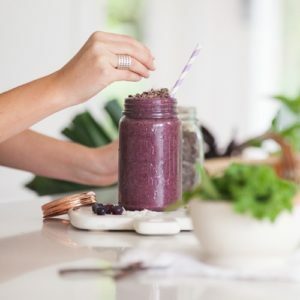 This smoothie tastes especially great if you fold in some crunchy magnesium rich cacao nibs and coconut flakes right at the very end before you serve it. What’s unusual about this smoothie, is the fact that I use a strong herbal infusion as the liquid base, which needs to be prepared the night before. By steeping herbs such as nettle overnight, the water acts as a solvent and pulls the minerals out from the plant and into the water. Energetically, nettle is a Mars plant – you can see the signature of this planet just by looking at it – the rounded leaves, covered in spikes that will sting you fiercely and leave a welt on the skin. It’s masculine, dynamic, intense, firey, hot and dry. Mars and Nettle are also both full of iron. This makes it a great nutritive, and a well known blood tonic. In addition to iron, it is especially high in calcium and magnesium. 1 cup (89g) of blanched nettles will give you 428mg of calcium, which is just over 40% of the RDI (at 1,000mg/day) for adults. It will also give you 1.46mg of iron, 8% of the RDI for adult women, and 51mg of magnesium, about 16% of the RDI for adult women [1, 2]. As a depurative, nettle leaf is great for cleansing the skin. A depurative is a term used in Herbal Medicine to describe a substance that improves detoxification and aids elimination, reducing the metabolic wastes that tend to accumulate in the body – particularly so under the skin, as with acne . This ability to get wastes moving and circulating relates again to it’s dynamic Mars signature. A small observational German study found nettle and dandelion juice intake orally improved skin parameters in healthy women . Additionally, nettles are extremely high in vitamin A . Vitamin A is a fat-soluble vitamin that is important in maintaining the health of epithelial cells in the body (such as those in the skin) . Vitamin A has been shown to be significantly deficient in people with acne compared with those who don’t . The other ingredients used are full of anti-ageing antioxidants, anti-inflammatory agents and essential fatty acids – all amazing for the skin! 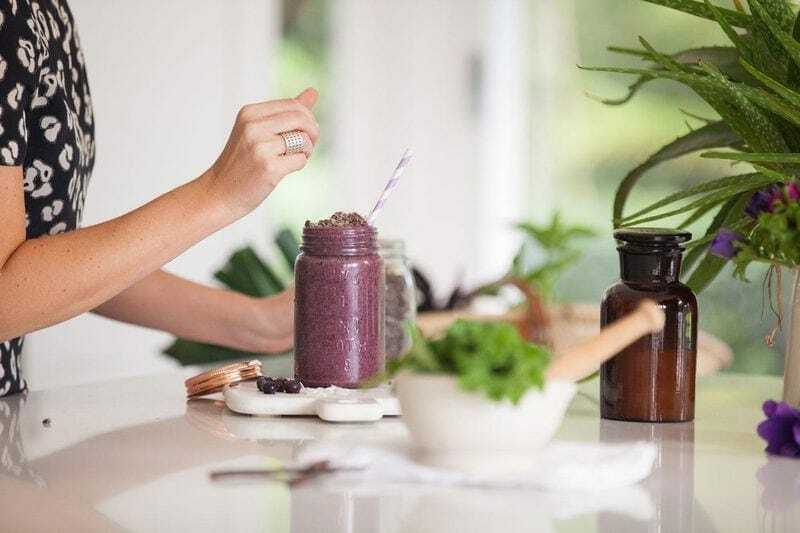 Maqui berry powder (from the dried Chilean fruit) is a highly concentrated source of antioxidants , which help prevent free radical damage and slow the ageing process. Like maqui berries, blueberries also contain abundant anthocyanins – natural antioxidant compounds, with anti-inflammatory effects . Cinnamon helps to balance your blood sugar levels [10, 11], and is a great carminative – meaning it helps prevent or settle gas in the digestive tract. Turmeric powder is highly anti-inflammatory and antioxidant rich . The flax seed oil provides plant based omega 3 fatty acids (ALA), which are essential to our diets. Most health food stores will stock nettle tea, though I find it more economical to order it in bulk online from stores such as Austral Herbs. Always choose certified organic. Check out my references page for places to source from. This smoothie is nourishing, mineral rich, anti-inflammatory, antioxidant rich and full of healthful fats. Nettle is particularly nourishing to the skin. Please note the active prep time excludes the 12 hours needed to super-infuse the nettle tea. Fill a 500ml glass jar ¼ full with dried nettle. Pour boiling water over it, right to the very top. Fasten the lid and let steep overnight. In the morning, strain the herb from the liquid – return it to the garden as compost, and use a cup’s worth of that lovely emerald green infusion as a base for your smoothie. Blend all ingredients together on high. Pour into a tall glass and mix in a sprinkle of coconut flakes and cacao nibs. Enjoy. Schmid, D., Lang, A., Allgauer, T., Bayerl, C., & Jung, E.G. (2000). Evaluation of effects on skin parameters of oral treatment with fresh pressed nettle juice and fresh pressed dandelion juice – an open, controlled, prospective study. Journal of Applied Cosmetology, 18, 167-176. Fredes, C., Montenegro, G., Zoffoli, J.P., Gomez, M., & Robert, P. (2012). Polyphenol content and antioxidant activity of Maqui (Aristotelia chilensis [Molina] stuntz) during fruit development and maturation in central Chile. Chilean Journal of Agricultural Research, 72(4), 582-589. Huang, W.Y., Liu, Y.M., Wang, J., Wang, X.N., & Li, C.Y. (2014). Anti-inflammatory effect of the blueberry anthocyanins malvidin-3-glucoside and malvidin-3-galactoside in endothelial cells. Molecules, 19(8), 12827-41. doi: 10.3390/molecules190812827.